Horns There are 19 products. 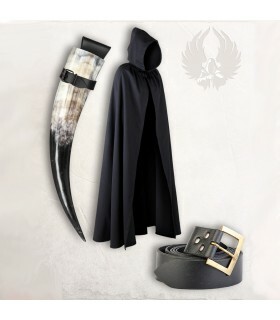 Set consisting of a black medieval cape with hood (one size), horn with baldric and a belt (one size). 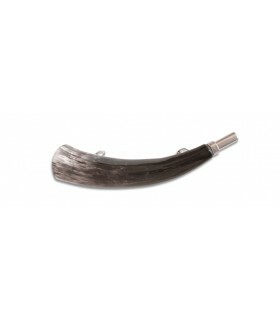 Viking horn without hole, 36 cms. 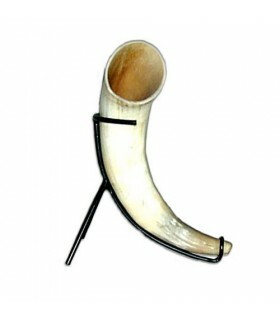 Functional English trumpet made of bull horn. It Includes 2 rings. English trumpet metal, 23 cms. Functional English trumpet made of gold metal. It Includes 2 rings. Metal English horn, 16 cms. 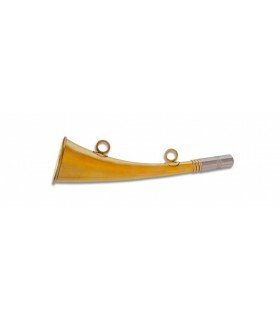 English trumpet 16 cms. Functional made of gilded metal. It Includes 2 rings for hanging. Jotünheim giant horn with capacity for 1.5 liters. In Nordic mythology Jotunheim is the world of giants. It is also the name of a mountain range in Norway. 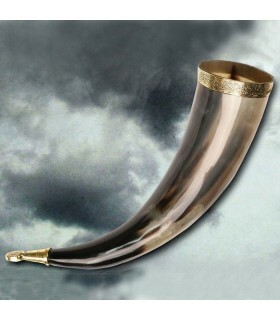 Viking horn without hole, 38 cms. 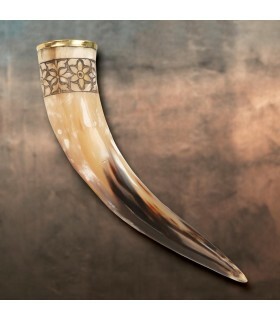 This magnificent Ragnar Viking drinking horn is intricately carved by hand with a line design. It comes with an adjustable leather belt cover. Because it is natural, the horn can vary slightly in color and size. It is recommended to wash the jug before drinking. Wash only by hand. 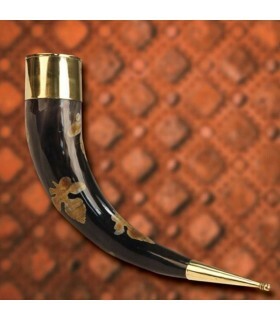 This drinking horn has a brass edge and is intricately carved by hand with a floral design. It's made for Viking royalty. This container is decorated in two colors. It comes with a suede case that fits any belt. Because it is natural, the horn can vary slightly in color and size. It is recommended to wash the jug before drinking. Wash only by hand. 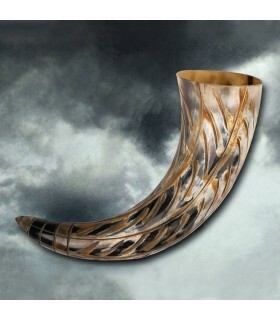 Horn is a bended osseus part of the animal which stands out from the upper zone of the head. Horns have above all a defensive function but sometimes they hava an offensive one. They are normally used for making extraordinary and singular items. 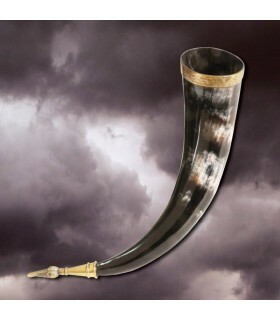 When we talk about horns, surely, what firstly will come to our minds is a viking horn. We must take into account that there are not official sources claiming that viking helmets had horns, given that it is said that they were generally used as trumpets or glasses. 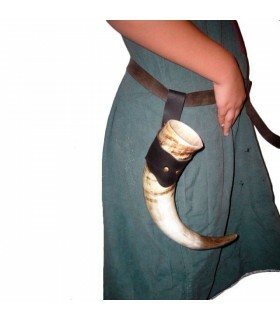 Horns were held attached to the belt with a leather stripe called baldric. 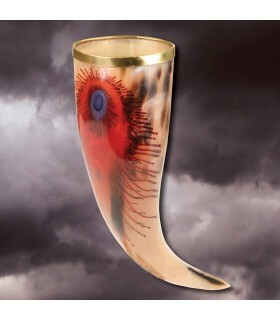 We have in our catalogue several replicas of horns related to viking mythology and History. 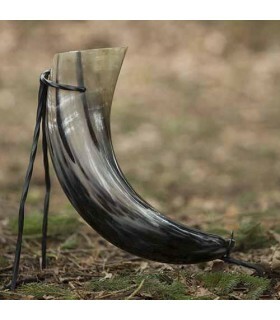 Drinking Horns: They are empty and sanitized, but also specially designed for drink consumption. 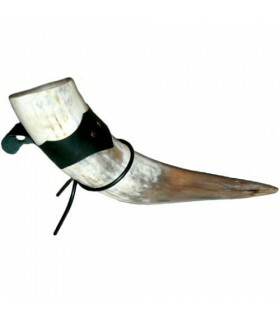 Jar Horns: Jars They are specially designed for drinking consumption and made of animal horns. 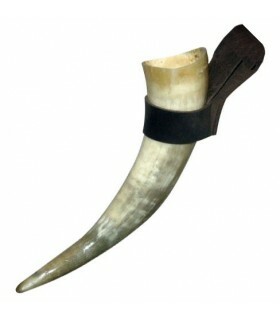 Sounding Horns: It is a hollow and non-pointed horn. Zip bags: A zip made of animal horns. Powder Compact Horns: They are ancient poweder recipents with a cover in its widest part and a metal point to ration the powder. 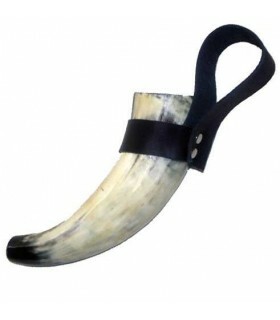 Our horns are a 100% naturals and they are made in Spain or other european countries. Every single horn has its own size, colours, bend...that's why we can consider that is pratically impossible to find two identical horns. They usually are in the following colours, black, grey, brown and beige. Some of them show: Light or dark spots, dark point, striped colours... 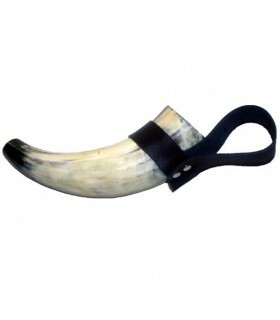 Horns can also be shown with a baldric (black, brown) which is normally attached to the belt, besides we also sell supports to keep them when we do not use them. 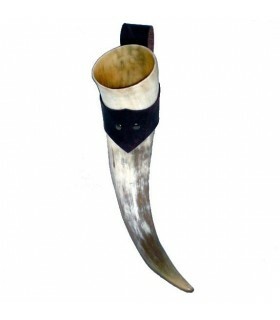 If you want to dress as a viking, you are looking for an original glass or a unique piece of collection; we recommend you to buy a viking horn. This a relevant historical complement which can not be missed in a viking costume. Our horns are made in Europe by means of handmade manufacturing. If you need more information about its production process or you just want to know about its characteristics, we will be glad to help you. Do you have any further questions?